Who hasn't signed up for a service and then completely forgotten about it? For me, it was an Amazon Web Services account that I signed up for as a grad student. Last year, I realized I hadn't actually canceled it and was being charged $10 a month. I paid $120 over the course of a year before taking a closer look at my credit card and finally canceling. Turns out I'm not alone. A lot of people don't realize that they're paying for services they signed up for ages ago and then forgot about. Startups like Trim and TrueBill are stepping in to help. Trim, which launched in November 2015, unearths subscriptions tied to your bank account or credit card and cancels unwanted ones. After signing up online, all interactions with Trim take place via text message. "I hadn't tried anything like this -- but had sort of always wished [it] existed," Kelly Kuhn-Wallace told CNNMoney. Kuhn-Wallace, 40, is a marketing consultant in Minneapolis and a self-proclaimed tech product junkie who discovered Trim on Product Hunt. Kuhn-Wallace signed up and said getting that initial text from Trim was "kind of embarrassing." It turned up three different subscriptions that she didn't know she was paying for and no longer used. Related: Is this app the call center of the future? "Someone with an MBA should not be paying for things they didn't know about," she said, adding that Trim canceled two of the services and she was reimbursed for the other. For some easy-to-cancel subscriptions, customers just text back "Cancel X" and Trim will take care of it for free. Two weeks ago, Trim launched a paid offering: $6 to cancel a service that requires more heavy lifting -- like navigating customer service phone trees or sending certified mail. Trim cofounder Thomas Smyth said "several hundred" customers have started paying since it launched. Trim said it has 25,000 registered members and is saving users $180 an average per year. The most requested cancellations are Planet Fitness, Kindle Unlimited, CBS All Access and Experian Credit Reports, according to Trim data. Trim used to be able to cancel Experian accounts for users via email, but in January, that changed. While Experian said it has never allowed for third party cancellations, it did start requesting social security numbers in order to cancel -- something Trim doesn't handle. TrueBill, offers a similar service. I linked my credit card account on TrueBill's website. Instead of a text, I received an email with the services I was paying for. The gym membership and a $49 charge for Amazon Prime, which I didn't *think* I was subscribed to. I've requested TrueBill to cancel it for me -- even though I didn't see the charge on my bank statement. TrueBill, which launched out of beta in February, offers that basic service for free. But it has also built out additional features, notifying members of price changes on particular subscriptions. "A lot [of companies] are sneaky when it comes to unannounced price increases," said cofounder Yahya Mokhtarzada. TrueBill, which was part of Y Combinator's Winter 2016 batch, just hit the 30,000 member mark. 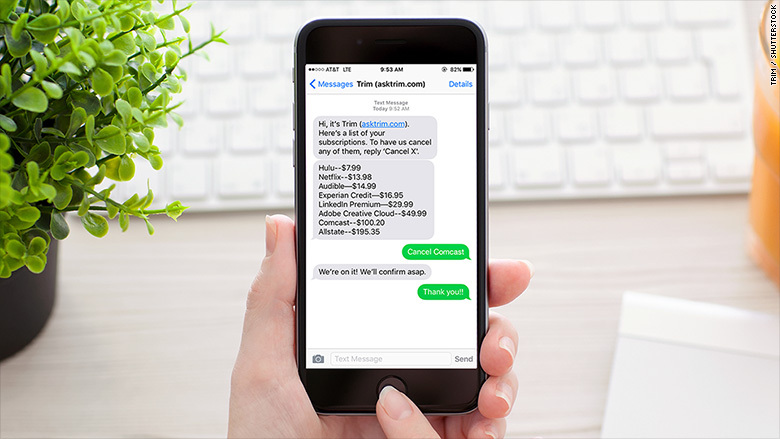 On Thursday, TrueBill launched a bot that integrates into Facebook Messenger. "It [will] essentially bring subscription management to a conversational format," said Mokhtarzada. Mokhtarzada said that on average, his company is saving its members $512 a year -- and it has found a way to handle Experian cancellations. "People are ecstatic when you save them money," he added. In addition to some savings, services like Trim and TrueBill also give customers piece of mind when trying out new services. "Actually, I'm more likely to sign up for things now because I know I have them in my back pocket," added Kuhn-Wallace. Correction: An earlier version of this story misstated the approval process for Truebill's bot.